Polos are shirts made out of knit fabric, which means they stretch and are quite comfortable to wear. They’re like T-shirts but dressier. The neckline on the polo has a collar and a placket with several buttons. Men, women, and kids all sport polos, often with a manufacturer’s logo and sometimes with a pocket on one side. Polo shirts, especially ones that feature the right logo, were once known for being part of the quintessential preppie look. Now men wear polo shirts for a casual-dress look anywhere. This look goes from high-end restaurants to the grocery store, from the office to a pre-game party. One of the few places you’ll feel quite out of place in a polo? An extremely hip urban club. Think of a polo as a good T-shirt with a collar. The cotton is also heavier and of a better quality. Draw a top half of a guy. Map out a square shape for a polo shirt and draw in the side seams, following the sides of the body. Add a couple of folds at the waist where the fabric rests on the hips. Draw the collar and neck hole by adding a triangle on each side of the neck with a V shape between them. Draw short sleeves and add the shoulder seams. Soften the collar triangles by curving the lines a bit to follow the shape of the shoulders and neck. Add two or three buttons at the neck on the right side of the V and finish with topstitching on the hem of the sleeves and bottom of the shirt. Women’s polos can sport the same collar type as a man’s polo but may also include a more feminine-looking collar and placket. The fit is also tighter on a women’s polo. 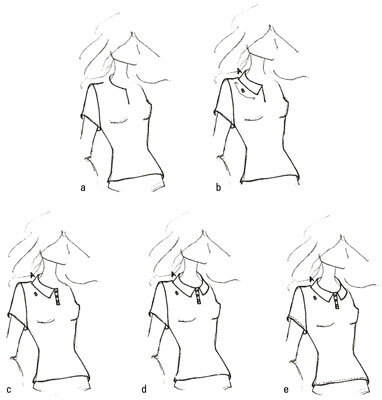 In this three-quarter view, start by drawing a basic shirt but don’t draw the neckline. Draw one side of the neck hole and placket. Draw a line coming from behind the neck and around to the front of the body, pivoting at the center front and going directly down a few inches, about halfway to the breast line. To start the collar, draw a short line from the neck to the curve of the shoulder. Opposite line A, at the point where the neckline meets the center front line, draw a short diagonal line away from the neck. Draw a slightly curved line that connects line A to the diagonal line you drew in Step 3. This completes half of the collar. Turn the center front line into a rectangle and draw three buttons on it. Finish the other side of the collar the same way as the first, connecting the lines that wrap around the neck. Finish the rest of the shirt with topstitching at the sleeve hem and bottom hem of the shirt.